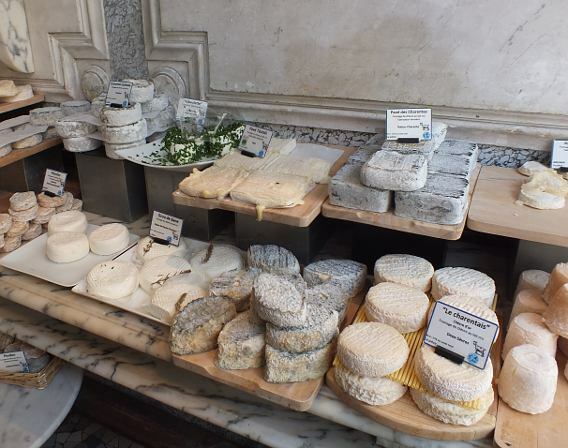 To give you a sense of how much we love cheese in my family, I will tell you that my mother once toyed with breaking the law bucking the system to smuggle carry cheese in her suitcase on a return trip to Paris. When I asked her, “Do you feel like this cheese is really worth maybe getting arrested by customs?” she took a long time thinking about it. So did I. Because really, a good cheese might just be worth getting into a little hot water. Our people are French in heritage and we love our cheese. Cheese, however, does not always love me–one of many cruel food ironies. As we start our marathon training in earnest this week, I am on the lookout for some replacements that will give me the satisfaction of cheese without the tummy trouble on my long run the next day. I am also exploring other plant-based sources of protein and nutrition during marathon training with the help of a great website, The No Meat Athlete. We have been reducing our meat consumption for several years now, so this is just one extra shift in our journey. In general, I am not a big fan of cheese substitutes (and as I’ve detailed, I do love good cheese). Cheese substitutes often get the texture or flavor wrong and overall I’d rather NOT have cheese than to pretend I’m having cheese that tastes like salt or playdough. I have found some great ideas from other blogs that hold promise for me to enjoy some cheese-y flavor without any tummy trouble. If you are interested in trying something new or just shaving off some saturated fat from your diet, give these a try! The first good cheese substitute is nutritional yeast. I know, sounds gross, but bear with me here. Nutritional yeast is a deactivated yeast super high in B12. It is also a complete protein. So, by itself, it is very good for you and it has the added benefit of the wonderful umami flavor of Parmesan cheese. Nutritional yeast comes in large flakes, so this is not something you would serve on crackers, but it is amazing in soups, stews, scrambled eggs/egg substitute or in a pasta dish. You can mix it with some olive oil to add to foods or just sprinkle it over foods like you might a dry cheese. Definitely, it’s worth a try. Not sure if you would like it? You can buy nutritional yeast flakes in the bulk bin of Whole Foods or other natural food stores and try just a little to see if you like it. Cashews are amazing little nuts that, when softened, can replace peanut butter and even cheese! 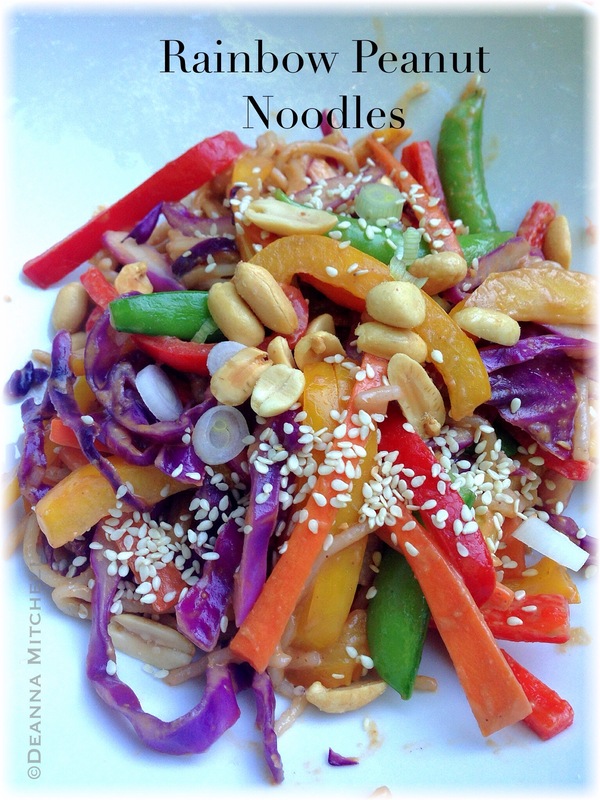 I love reading the blog My Whole Food Life (check it out!). 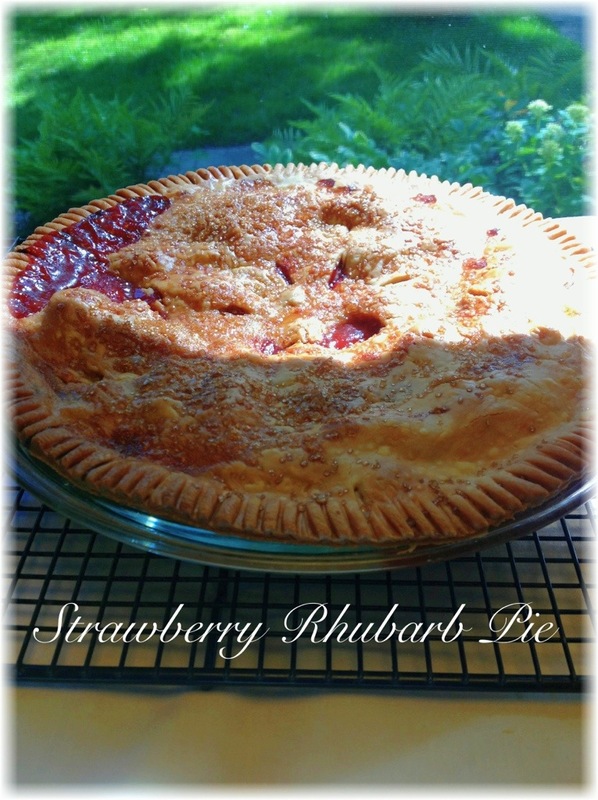 She has terrific ideas, recipes and now videos! I saw THIS video for a cashew cheese sauce and thought it would be great for nachos. It is easy to make, tasty and great for serving with corn chips, quesadillas or even drizzled over burritos. I’m not sure, but you could probably use this to make a vegan mac and cheese. I add a little more cumin and some red pepper flakes to the sauce because I like it spicy, but you could make this sauce yours in a million ways. Unlike conventional cheese sauce, this is healthy (have you read the ingredients in processed queso?) and without the heaviness or tummy issues of milk-based cheese. Watch the video, starring her lovely daughter and her husband and see for yourself! If you like what you see, you can subscribe to her YouTube channel and get more quick videos! Buddha bowls are pretty much what they sound like–fat little happy bowls full of goodness. 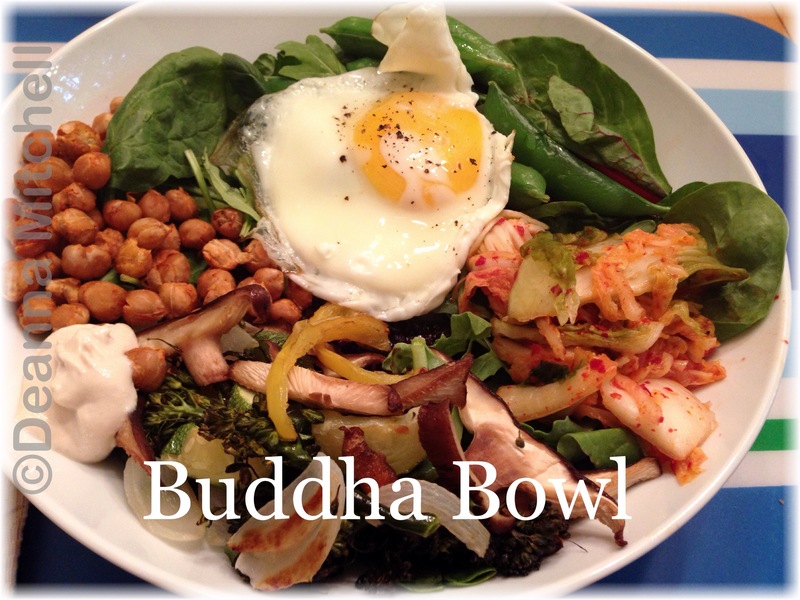 I’ve read various theories about the name Buddha Bowl–some think that the bowls are like a rounded Buddha belly and some liken the bowls to those that monks use to ask for their meals. I think maybe it’s just trendy, but if that is the case, they are at least trendy and delicious! Like all bowl meals, these are very flexible, allowing you to create whatever you like with whatever is seasonal. Also, these are a great way to use up those leftover grains and vegetables in your refrigerator. Buddha bowls seem to have a formula of sorts and this seems to represent: grains + greens+ vegetarian protein + fermented vegetables + light sauce. Our bowls contained black rice, baby kale, toasted chickpeas, roasted local vegetables (mushrooms, zucchini, onion, peppers), steamed sugar snap peas, kimchi, tahini sauce and a fried egg. 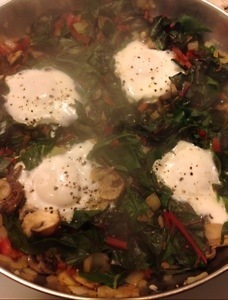 The egg, of course, does not make this a true vegetarian dish, but if you eat eggs, I highly recommend adding one. A note about black rice. Black rice is higher in nutrients, antioxidants and fiber than white rice. In my experience, it takes longer to cook (more like wild rice), so if you use it, be prepared for longer cooking times! It does have a nuttier, smokier flavor and we love it! Drain and rinse the can of chickpeas. Toss with salt and pepper and any seasonings that you like. Put drained peas in a cake pan or other shallow pan and add to the oven. Cook for about 30 minutes, stirring frequently. They should be a little crunchy, but not burned. Line a sheet pan with foil. Add zucchini, mushrooms, onion and pepper and broccoli to the baking sheet. Toss all with the toasted sesame oil, salt and pepper and arrange in a single layer. Roast vegetables in the oven (while chickpeas are roasting) for 20 minutes, flipping them over at 10 minutes. Assemble your bowls. Line each bowl with some fresh greens. Add a cup of the grains to the center of each bowl. Arrange the roasted vegetables, sugar snap peas, chickpeas, kimchi and tahini around the rice. Heat a saute pan over medium heat and cook the eggs, sunny side up, until done (about 2 minutes). Top each bowl with an egg. One of the wonderful things about making jam with blueberries is that a lot of the work is done for you. Unlike strawberries, which require hulling and chopping, blueberries just need a quick wash and a check for any remaining little stems and you’re ready. 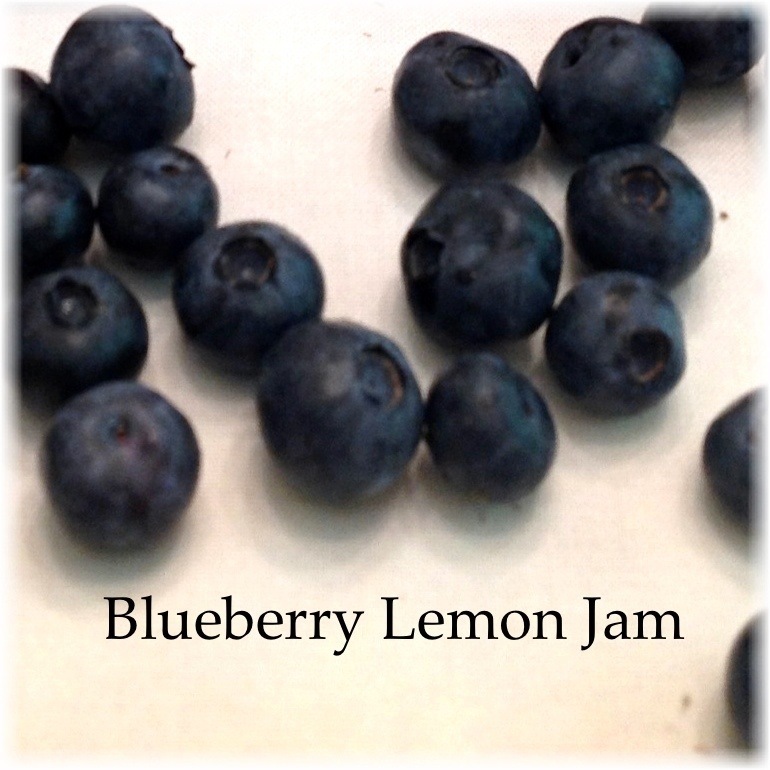 Also, blueberries have a lot of natural pectin, so you don’t have to use any pectin at all, unless you’re in a hurry. If you want to use a pectin recipe, try using Pomona’s Universal Pectin. It is harder to find (Whole Foods does carry it, as does Amazon), but you can make low sugar jam using this pectin. Typically, I use about 1 cup sugar for 6 half-pints of jam. I love that because what I want to taste is the fruit, not sugar. 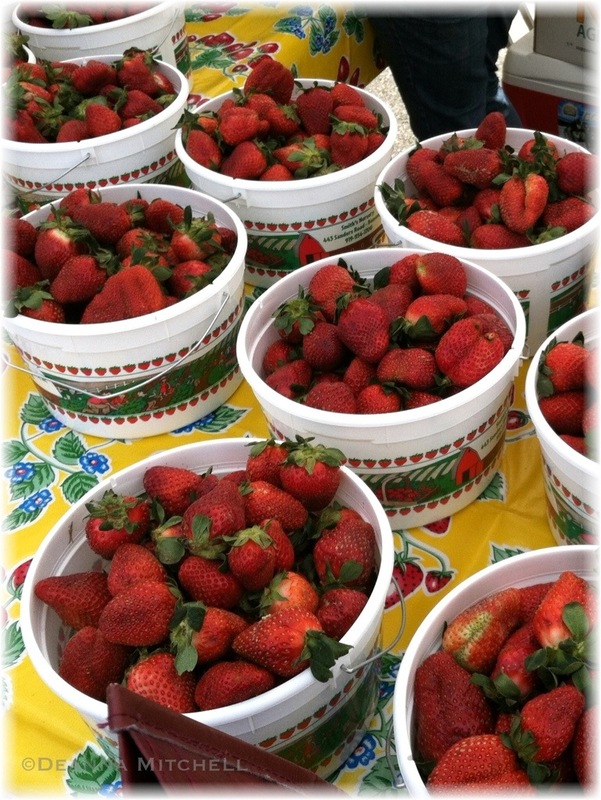 Other pectins require almost 1 cup sugar for each cup of fruit, which seems ridiculous. Watermelon is one food that makes my summers extraordinary. Ripe tomatoes are right up there as well (nothing beats a summer lunch like a tomato sandwich), but ripe, cold watermelon is the antidote to our hot, sticky summers. This smoothie is like summer in a glass–perfect after a long run or a day at the pool. With no added sugar, it is also a healthy way to rehydrate! 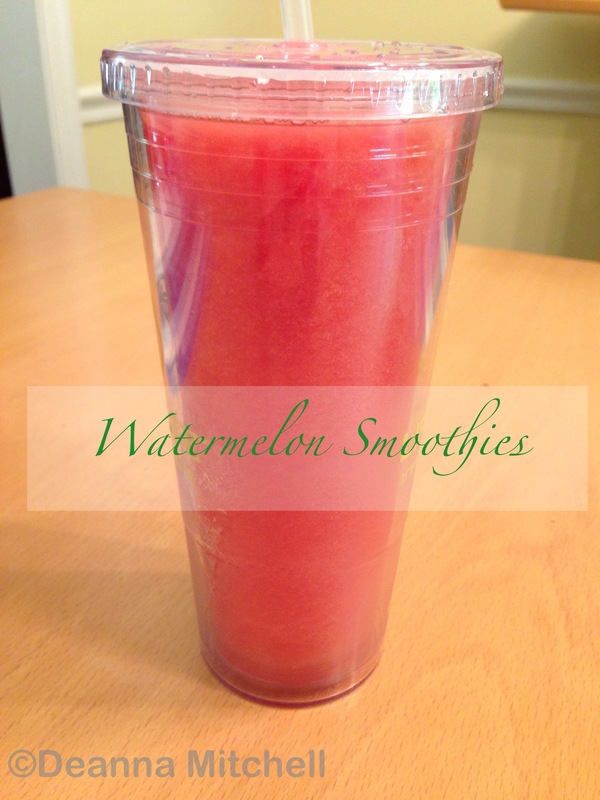 Don’t leave out the lime juice–it really helps balance out the sweetness in the watermelon. Egg salad. Oh yes, summer is here. When the days are warm and no one feels like cooking (well, not me anyway) and the thought of something cool and creamy for dinner makes everybody happy, it is time for egg salad. This is one of those dishes that is quick, easy, delicious and very budget-friendly–even if you buy farm fresh eggs like we do. Any dish where eggs are the star deserves farm fresh eggs. We buy our eggs from farmers who pasture raise their chickens–not only do the egg yolks look healthier in color, but the eggs themselves taste noticeably better than grocery store eggs. They are also healthier for you, providing more omega-3 fatty acids than factory eggs and packing more protein as well. I know people who don’t like to make this dish because they have a hard time peeling their hard boiled eggs. The recipe below details my system and I have never had this go wrong. Yet. You can make this cold salad up to 24 hours ahead. Keep in the refrigerator with a slightly damp paper towel or piece of plastic wrap covering (touching) the surface of the egg salad to prevent any discoloration. Egg yolks, like avocados or bananas, react quickly to oxygen in the air and can turn brown. This doesn’t mean it’s bad, but it won’t be as appetizing. 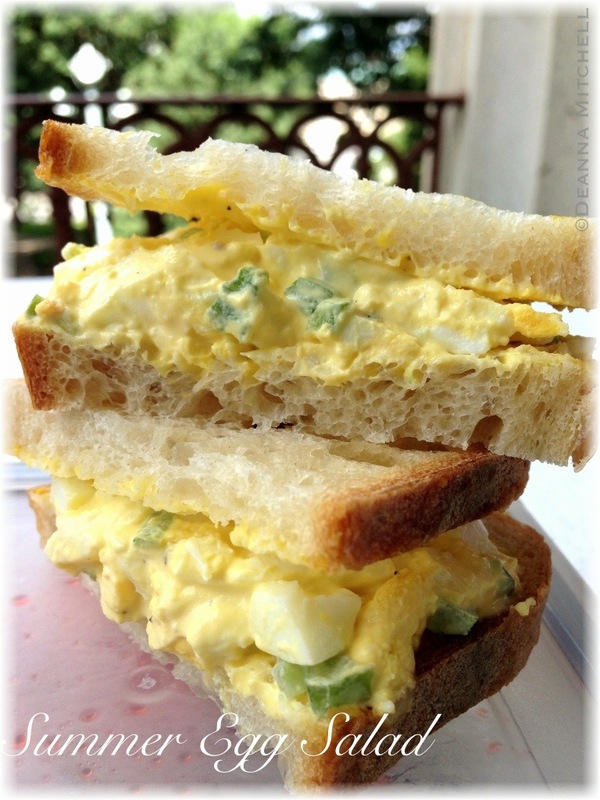 We serve our egg salad with locally made sourdough from La Farm bakery or honey whole wheat from Great Harvest Bread Company. Pumpernickle is good, too, if you can persuade your children to eat it (if you can, please send tips). It is also delicious served on a bed of greens. Good sides for egg salad include homemade pickles or pickled okra, celery sticks, carrot sticks or even kale chips! Gently put the eggs in a stock pot or large saucepan. Add water to cover eggs by 1″ and cover pot with lid. Heat pot over medium high heat until water starts to boil. Remove from heat, and let sit for 12 minutes. Unocover pot and remove eggs to a colander. Run cold water over the eggs to stop the cooking process. One at a time, take each egg and gently tap it all over its surface so that the surface of the egg has small cracks all over it. Holding the egg under a stream of cold water, gently peel the shell from the egg. The running water helps a lot. If some of the white sticks to the shell, that’s ok. You’re going to mash them up anyway. Put the peeled egg in a medium sized mixing bowl. Continue with all your eggs until they are all peeled and in the mixing bowl. With the back of a fork, mash the eggs so you have a rough mixture of egg whites and yolks. Add the remaining ingredients to the bowl and mix together with the fork until you have a thick, yellow mixture. Add more mayonnaise if your mixture seems too dry. Taste for seasoning and correct as needed. 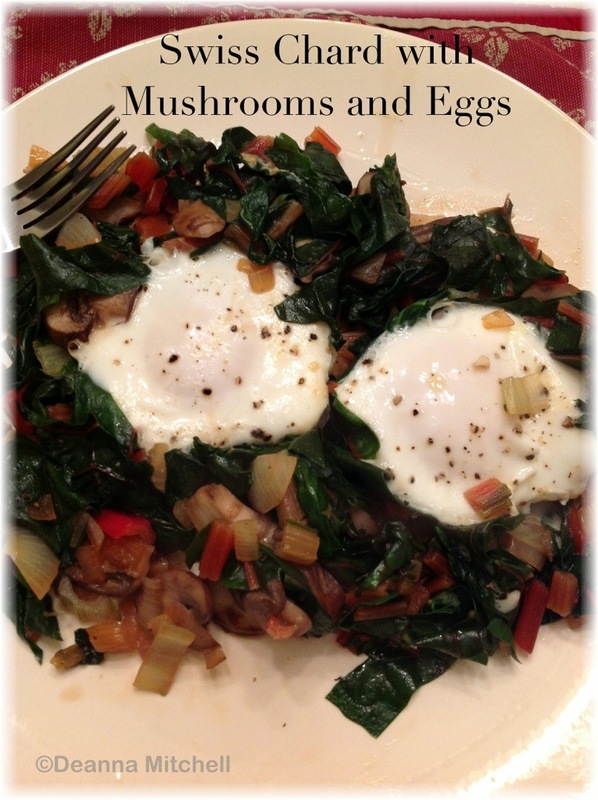 Serve on bread, toast or on a bed of greens! One of my earliest memories of winter is walking off a curb, into a snow bank and finding myself surrounded by snow over my head. It seemed like such a magical thing, to be completely enveloped in soft, noise muffling snow. I may have been only 2 or 3 years old at the time, but that image of looking up and seeing nothing but snow and a peek of sky has stayed with me. Friends, I am here to tell you that the magic of winter is gone for me. I am cold–are you cold? I am not the biggest fan of cold weather in the best of circumstances, but this winter has just been downright ridiculous. Since I can’t change the weather (I have tried), the best thing I can do is hunker down and eat cozy, warm, comfort foods. Like this soup. For me, winter soups need to be substantial, but also healthy. I like them hearty, with lots of delicious vegetables and either beans or pasta. This rustic white bean soup is easy to make and doesn’t require a lot of chopping or prep work. Easy, warm, nutritious and comforting. Just the thing to help me survive until spring! I prefer cooking soup in a stock pot, but you can make this soup in a slow cooker by cooking on low for 6-7 hours or on high for 4 hours. Don’t skimp on the rosemary or garlic–they give this dish a lot of great flavor! 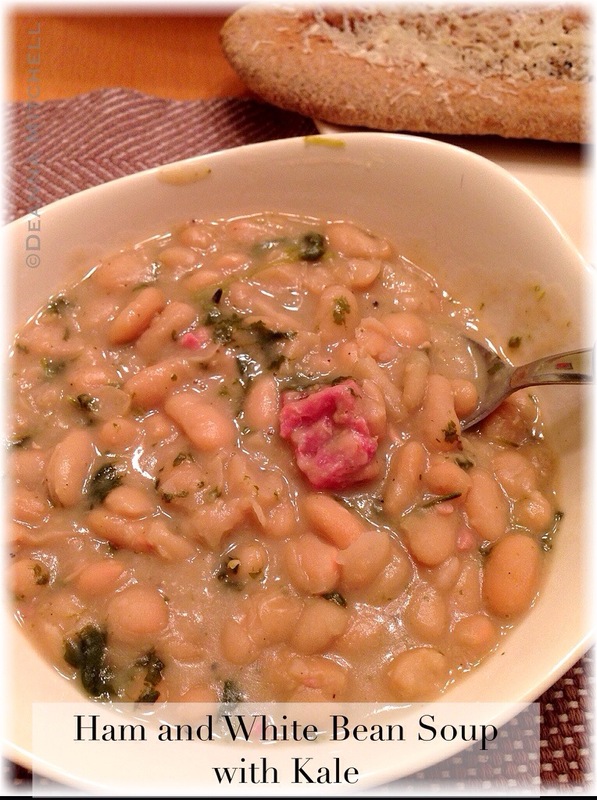 A note about the beans: This dish will taste even better if you use dried beans and dehydrate them overnight, but if you are in a hurry you can use canned cannellini beans instead and cut your cooking time to about 45 minutes. Night before (if using dried beans): Put the dried beans in a large bowl and cover with water plus about 2″. Cover and let sit overnight or for 7-8 hours. In a 10″ saute pan, heat the olive oil over medium heat. Add the onion and carrot and saute for 5 minutes or until the vegetables are soft and the onion is translucent. Add the garlic and cook for 1 minute. Remove from heat and set aside. If using dried beans, drain the beans, discarding the soaking water. In a stock pot, add all the ingredients except kale, salt and pepper. Heat over medium low and simmer for 4-6 hours. Check every once and a while and if the soup is too thick, add additional stock or water. Check for seasoning and add salt and pepper as needed. Add the kale and simmer for another hour. Serve hot with crusty bread or a side salad.